When was the last time you looked up and saw the stars? I mean really saw the stars. Enjoying a frosty beverage on my balcony at The Waterfront Inn on Lake Temiskaming with a couple friends, we were amazed at how much more vibrant and plentiful they can be without the obstruction of air and light pollution. This is just one of the many things that made the motorcycle ride up to the City of Temiskaming Shores a worthwhile adventure. Located roughly two hours past North Bay, the community is composed of the three former municipalities of Haileybury, New Liskeard and Dymond who amalgamated back in 2004. Each offering their own unique benefits and charm, New Liskeard is a quaint little town that attracts thousands of riders every long weekend in July for the annual Biker's Reunion. Consider it the Port Dover of the North. Frustrated by the sheer amount of people and traffic obstructing my last few outings in the city, I decided to head North after hearing from several former attendees that the area had a great deal to offer. Turns out, they didn't steer me wrong. 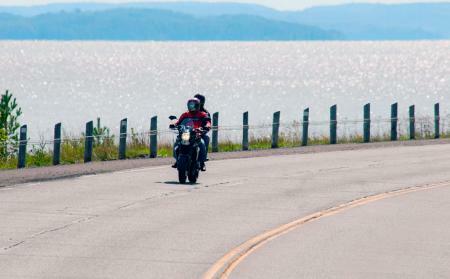 The Lake Temiskaming Loop, as it is known, offers a self-guided motorcycle tour that is home to three cultures, two provinces and one lake. Thanks for the write-up and link KawiMan. The midnight sky north of Bancroft(south Algonquin Park) on New Years (snowmobiling) left a lasting impression on my mind...wasn't much black between all those stars! Hard to find the big dipper! My wife's favorite aunt lives in North Bay and we're planning to do that loop next summer, most likely August when it's a little warmer.